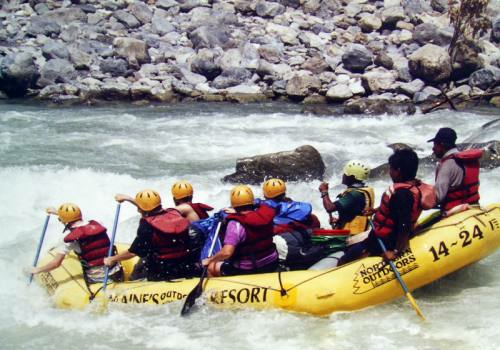 Sunkoshi River Rafting is yet another destination for White Water River Rafting. We take a scenic drive to Dolalghat for the raft ‘put-in-point’ which cover a distance of 57km, arriving within 3 hours. The level of excitement begins and ends right after covering 210km of wild and heavy rapids through the elevated rock spotted ways after rising from the mountains towards the flat land of Southern part of Nepal. Among the 10 classic White Water River Raft, Sunkhoshi is the one, which is known as a river of gold. In our Nepalese context, Sunkoshi River offers the greatest river journey and the majority of mesmerizing hardly any rivers. Sukhoshi River flows down through the mountains which are covered with snow. Gigantic waves, lukewarm water, striking scenery and vast camping are the positive point of this river trip. 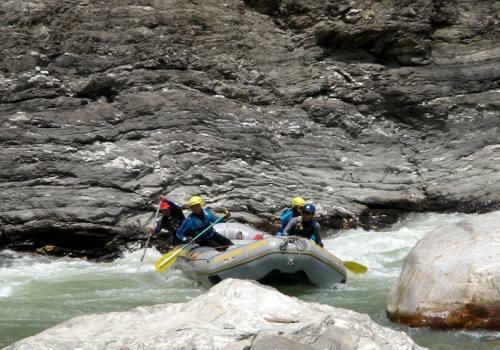 Sunkoshi River Rafting comes into the category of medium and high flows. The 11 day itinerary is surely an amazing trip, which gives you long lasting memories. 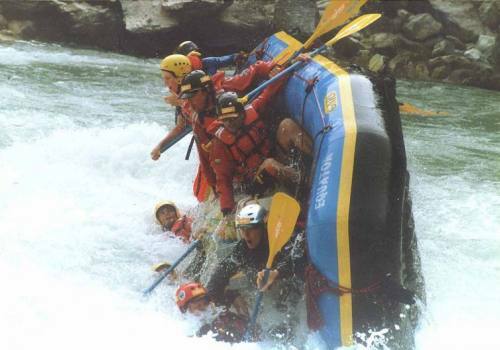 You will never have same kind of rafting experiencing as its nature is dynamic. 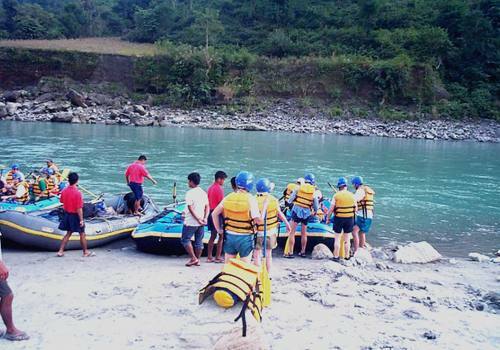 Sunkoshi River Rafting provides abundant rapids like Meat Grinder, High Anxiety, Punch and so on, scaled from 3 to 8. These scales emerged into the low land of Terai. Day 02Drive to Dolalghat, Raft to Tarang Gaon Today, we drive to Dolalghat from Kathmandu (about 3 hours). When we arrive to Dolalghat, we hop in the rafts and head to Tarang Gaon. It is a short rafting trip today. Overnight in tented camp. Day 03Raft to Dumja VillageToday, we move from Tarang Gaon to Dumja village, a pleasant four hour rafting journey. You will experience the rapid known as “Khuei Bhai”, spotted with rocks and stone. Because of this, we should be alert and keep an eye out for rocks. You will be spending your night near the Mahadev temple. Overnight in tented camp. Day 04Raft to KhunkotOur 6 hour journey to Khunkot begins after breakfast. This is a kind of wild and wet rafting journey where we are continuously battled by the rapids near the fishing village of Kodaris and Chamera Bhir. Overall you will experience an entertaining and exciting day. Overnight in tented camp. Day 05Raft to Likhu KholaAfter breakfast, we begin the five hour float to Likhu Khola, passing a few Raj villages along the way. The rapid get heavy in the afternoon, and calm down afterwards. You can snap some photographs, as there are plenty of good opportunities. Overnight in tented camp. Day 06Raft to Harkapur Village It takes about 6 hours to raft from Likhu Khola to Harkapur village. During the day, we will cross through cavernous gorges interspersed with thrilling rapids relating enjoyable floats in the afternoon. You can view the crowd of Langur and Rhesus monkeys on the bank of river. Overnight in tented camp. 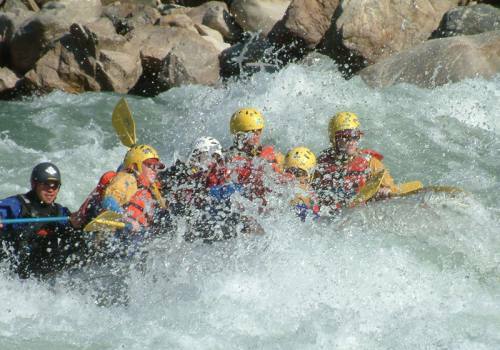 Day 07Raft to Raj GhatToday you will be rafting in Raj Ghat taking exactly 6 hours. On this day you will experience the most thrilling and difficult rapids. You'll have to give the guides a hand while crossing through the Bridge rapids, Krishna rapids, Mangal Rapid, Roller Coaster. Overnight in tented camp. Day 08Raft to Bander GhatOn the 7th day you will move to Bander Ghat covering 6 hours. You have to hold tight, the ride is not over yet as past the point of Sap Su Khola is a rapid with the greatest drop Huge ‘holes’ ‘eddies’ and churning ‘stopper waves’ demands team work and hard paddle. Overnight in tented camp. Day 09Raft to Bonjor Ghat On the 8th day you will raft in Bonjor Ghat taking 6 hours. You will be experiencing the rapids time and again. After taking breakfast you will be rafting from the morning. You will be rising from the Mardheku gorge which is wide and less troubled as it is internment linking steep cliffs and gorges. Overnight in tented camp. Day 10Raft to Barahchhatra, Drive to KathmanduOn the 9th day you will be rafting in Barachhatra from Bonjur Ghat taking exactly 6 hours. This is the end of White Water River Rafting. 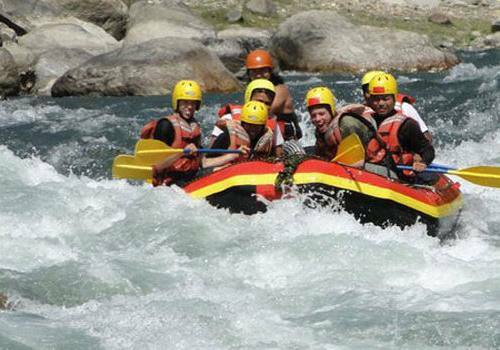 Obviously you will experience lots of rapids which are full of excitement and adventure.